A touring feature documentary series event and Q&A session. Come and be a part of this unique event. Watch the film and share your thoughts in an after film conversation with the filmmaker, Christopher Robin Collins, and guest speakers on this fascinating subject. Infinity is a new entertaining and engaging, high quality feature documentary film series, exploring one of the most significant unanswered questions of our time ‘Does infinity exist?’ Conversations with leading thinkers from multiple disciplines reveal the latest in scientific research and a broad range of perspectives and insights. Infinity is a film of great beauty and scientific substance but is also very much about the human perspective of infinity. Conversations with scientists, philosophers, religious leaders, artists and more are merged into a filmic narrative with a powerful soundtrack and stunning visuals. The film explores new scientific thinking in terms of multi verses and the big squeeze, parallel dimensions and string theory. If infinity exists, then it implies that the big bang is an incomplete theory and we have to look towards the multi verse theory as the most likely scenario. 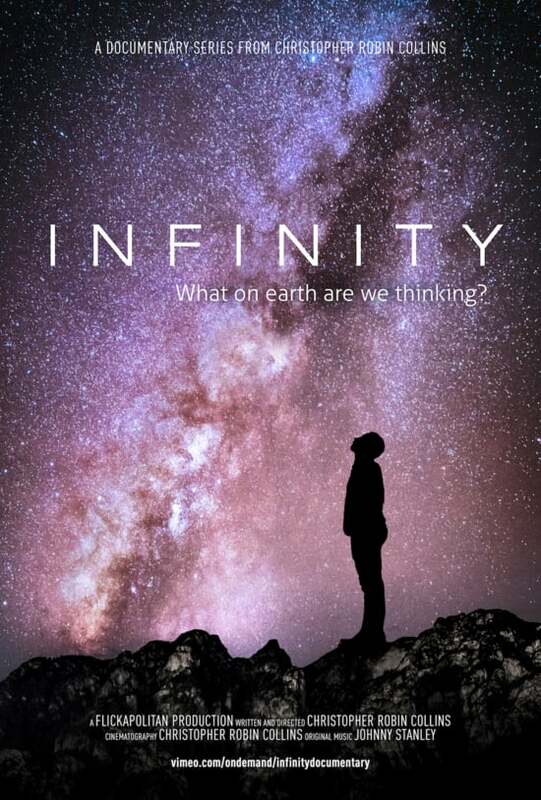 What does infinity mean for our spiritual existence and continuation of life on earth and beyond?